NMN Danton. 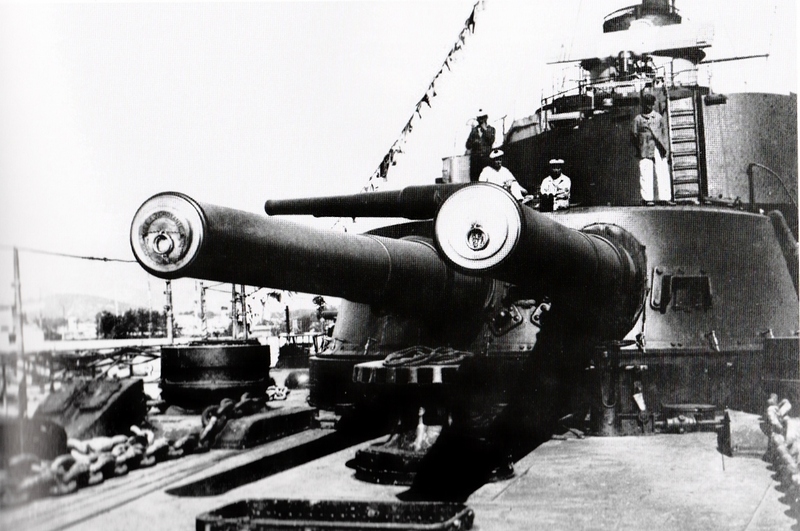 30 cm (12") guns are in the bow and stern turrets. 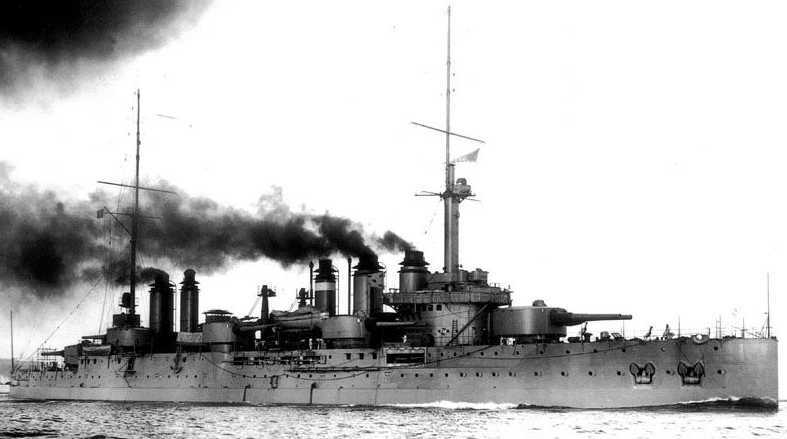 The French navy used the Model 1906 on the last of their pre-dreadnoughts and the Model 1906-1910 on the first of their dreadnought battleships. Both models are listed as being used as railway ordnance during World War I. Construction was a complicated built-up design, similar to other French heavy guns. The two model types were similar, differing in minor constructional details. These 30 cm/45 guns were of lighter construction and had a stronger breech piece than the previous 305 mm/40 guns. Breech mechanism for the Model 1906 was Manz-type interrupted screw breech block while the Model 1906-1910 used a Welin breech block which could be operated electrically or manually. French guns designed between about 1902 and 1922 were designated in centimeters. Actual bore diameter was 30.5 cm (12.008"). ^The unusual designation "1906-1910" for this gun was to indicate that its design was basically the same as the Model 1906 gun but that the design had been slightly modified in 1910. ^The firing cycle was officially listed at 28 seconds. ^A Note on Sources: The secondary sources listed below differ greatly on the details for the ammunition used for these guns. John Jordan kindly provided me with information taken from French official documents and these values are used throughout this section. ^Weights for the APC 1906 differ in official documents with a weight of 970 lbs. (440 kg) also being seen. ^3.13.2The APC projectiles for these guns were classified as obus alourdi (heavyweight shell). The base fuzes for these projectiles had a dual delay mechanism which in theory enabled them to engage both thin-skinned and heavily armored targets. They therefore replaced both the separate APC (obus de rupture) and SAPC (obus de semi-rupture) shells carried by earlier battleships. These dual delay base fuzes did not work particularly well but their performance was improved over the years. ^The actual Model year for this APC is not known. "1910" is John Jordan's best estimate based upon official French documents. Weights for the APC Model 1910(?) differ in official documents with a weight of 952 lbs. (432 kg) also being seen. ^As an attempt to increase the range of these guns against land targets, in 1917 the Navy adopted an HE shell that had been developed by the Army for use with its railway guns. The official designation of this shell was FAB Guerre Mle 1916. About 70 of these shells were carried by each ship. ^As these guns had a steep twist (1 in 43), the shells for them had relatively short bodies. ^Propellant charges were in quarters for both the Model 1906 and the Model 1906-1910 guns. A Note on Sources: "Naval Weapons of World War One" incorrectly says that the charges for the Model 1906 gun were in halves. ^The propellant load for the HE Model 1916 projectile was reduced from that for the APC Model 1906 as the HE projectile had thinner walls than did the APC Model 1906 projectile and could not handle the added stress of a full charge. This lower charge weight still gave the HE Model 1916 a much higher muzzle velocity and a longer range than either of the APC projectiles. ^Muzzle Velocity for the Model 1906-1910 gun using APC Model 1910(?) differs in official documents with an MV of 2,618 fps (798 mps) also being seen. Projectiles had three driving bands. These projectiles were not given dye loads during the 1930s as they did not have a ballistic cap to accommodate them. This was probably because when the French Navy was implementing dye loads in the late 1930s, the two surviving (active) ships of the Courbet class were both being used as gunnery training ships and not as front-line units. Data from "French Battleships of World War One" and described as taken from "Les cuirassés de 18,000 tonnes" by Robert Dumas and Gérard Prévoteaux. ^The Danton class mountings were originally to have been identical to those for the previous 305 mm/40 mountings. 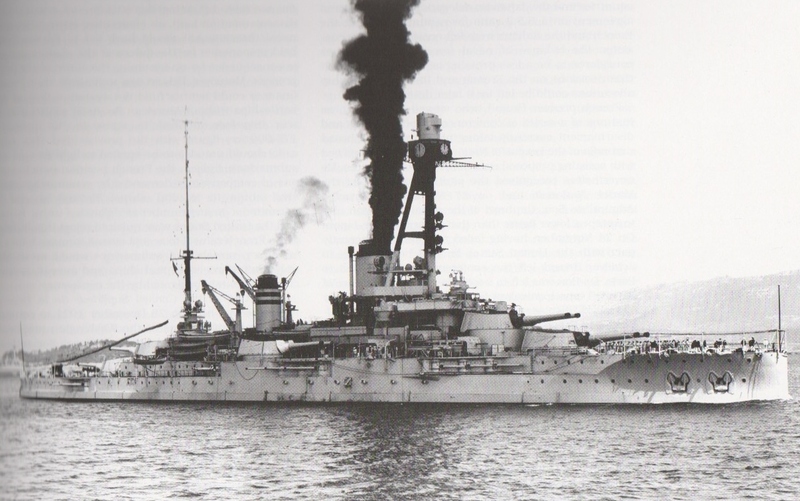 Concerns about a fixed loading angle reducing the rate of fire and inspection of a British-built Japanese battleship led to an improved loading design. These guns were given a parallel-action loading tray which at its highest position was in-line with a fixed waiting tray. The shell cage delivered the projectile to the waiting tray from where it was pushed over to the loading tray. The loading tray then sank down until it was in line with the breech where it was locked so as to follow the gun as it elevated. When the breech opened, the tray could be swung over into the loading position where a spring-powered rammer pushed the projectile into the breech. The rammer spring was recocked by the recoil of the gun. Propellant charges were loaded by hand. The guns elevated together but could be independently declutched and then lowered to the loading position without disturbing the gunsights. After loading, the gun would be brought back to the same elevation as the gunsights and then reclutched to the shaft. These mountings were designed by Saint-Chamond and were of the traditional pivot-type with all-electric power and spring run-out. Each turret had a shell and propellant handling room at the base of the hoist and a second handling room at the bottom of the rotating trunk. Each gun had a single-stage electrical hoist with a cage holding a projectile (upper platform) and four quarter charges (lower platform) from the handling room to the gunhouse. ^The Courbet class mountings were patterned after British designs, with the hoists broken at the working chamber. The working chamber and the trunk for the lower hoists were suspended beneath the gunhouse and rotated with it. Unlike British designs which used hydraulic power, the French design used electrics similar to the Model 1906 design. Guns were independently sleeved or could be elevated together. Elevation motors were designed to operate with up to a 5 degree heel angle. Handling rooms for the magazines and shell rooms were superimposed, one per gun. Each gun had a dredger hoist with a single cage that lifted the projectile and four quarter charges together to the working chambers. Projectiles were moved from the shell rooms on trolleys and then slid into a bronze tube at the hoist station while the quarter charges were moved by hand. When the cage arrived at the working chamber, projectile and quarter charges were tipped onto waiting trays inclined towards the upper cage hoists. The upper hoist cage had three levels with two quarter charges on each of the upper two levels and the projectile on the lowest level. The upper hoists were concentric with the path of the breech of the gun and a compensation system kept the cage aligned with the breech to allow all angle loading. The chain rammer was electric powered and was attached to the gun cradle to allow all angle loading. Three ramming strokes were required to load the gun. ^Elevation for both the Model 1906 and Model 1906-1910 was by electric motor with twenty speed selections. Manual training was possible with a single crewman able to elevate the guns at 0.5 degrees per second. ^Training in the Model 1906 was by electric motor with ten speed selections. Manual training was possible with ten crewmen required with training speed reduced to 1.5 degrees per second. ^Training in the Model 1906-1910 was by Janney electric motor with selectable speeds. Manual training was possible with six crewmen required with training speed reduced to 1.5 degrees per second. The Danton class had four ready projectiles for each gun and a total of thirty-two quarter charges were stored in each turret. The Courbet class had six complete rounds for each gun, two in the working chamber and four in the gunhouse. Each turret had a turret captain, a trainer, two layers, four breech workers, two hoist operators, six crewmen to work the air blast, waiting trays and to load the ammunition. The turret captain was equipped with a Barr & Stroud 1.37 m (54 inch) FQ2 rangefinder. During 1914-1916 the Courbet class had these replaced with Barr & Stroud 20 ft. (6 m) FT rangefinders in a "triplex" mounting. Post-war, these were redesignated as Rangefinder Model 1912-14. The gunlayers had telescopic sights and equipment calibrated for ranges between 0 and 13,000 m (0 to 14,220 yards). Armor thickness for the Danton Class as given in "French Battleships of World War One:"
Armor thickness for the Courbet Class as given in "French Battleships of World War One:"
Bow turrets on NMN Courbet ca. 1918. During World War I, guns and turrets were unpainted and instead coated with a mixture of grease and soot to prevent rust, making them appear black in photographs. The mixture was informally named bouchon gras - "greasy cap" - by the crews. U.S. Naval Historical Center Photograph # NH 42849. NMN Courbet in 1939 as a gunnery training ship.